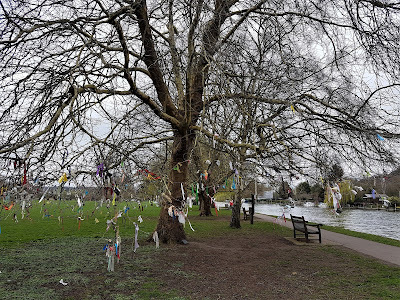 A bad witch's blog: Marsh Meadows Wishing Tree - What Do You Think? Marsh Meadows Wishing Tree - What Do You Think? 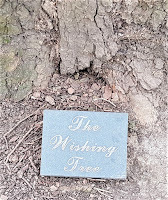 This is a photo of the Wishing Tree in Marsh Meadows, Henley. The photo above and the others on this post were taken recently by someone who reads my blog. They said: "As I was walking along the river I saw this, the Wishing Tree, and thought of you. It's in a park near the weir where they have planted several healing trees but someone's really gone to town with the ribbons on this one! I include the little plaque that goes with it." I must say I have mixed feelings about it as the practice of tying ribbons - or clouties - to trees is extremely controversial in the pagan community. The problem is that ribbons will not rot away unless they are made of natural, biodegradable fabric - and many aren't. Man-made materials, especially plastics, are harmful to animals. Also, if there are too many ribbons tied to a tree, the excess weight can damage it and man-made materials will stay there and constrict the branches as they grow. If you are going to tie a ribbon to a tree and leave it there, even where it is permitted, please make sure it is natural fabric. On the other hand, I do think ribbons like these can look very pretty and there are many traditional tree-dressing folk customs around the world. I did some research too. 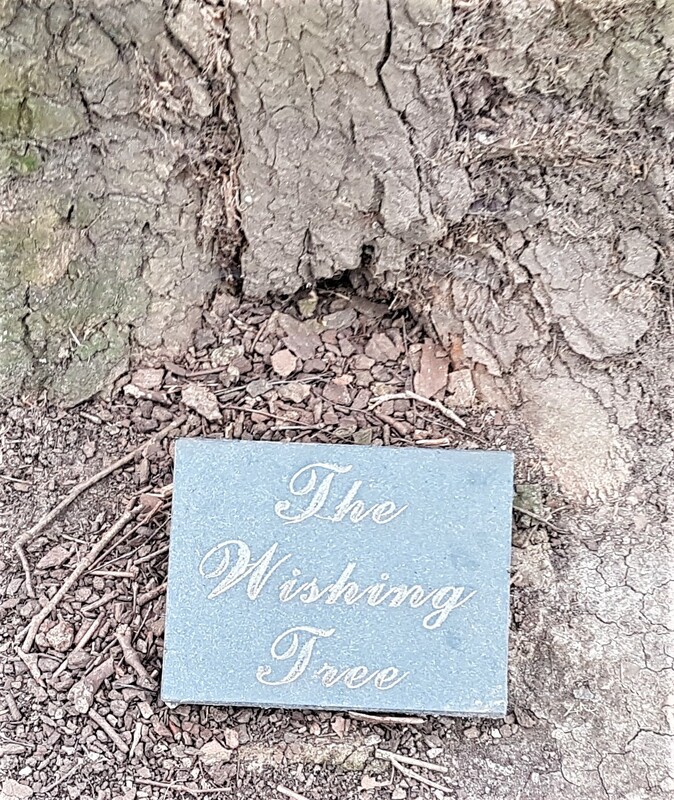 The Wishing Tree was dedicated by Val Stoner at the Autumn Equinox 2017 as a community project in the hope that people would make wishes for the higher good. 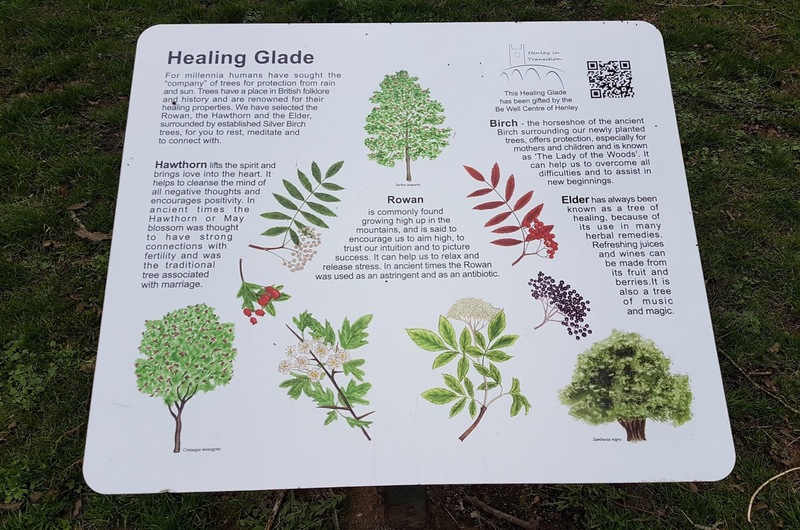 The tree was adopted by the town council, with councillor Kellie Hinton saying it was 'a lovely project'. You can read a news story about it here. So, on the plus-side, I can see that the local council and community clearly love the tree and have embraced its purpose. 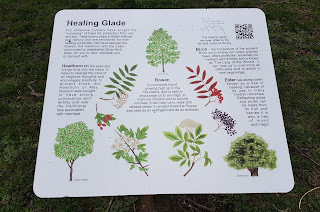 The tree itself is a sycamore, which is hardly an endangered type. In my garden I am constantly having to weed sycamores seedlings out of places I don't want them. If this tree gets a little damaged, it will hardly be irreplaceable. But what do you think? Do leave a comment. I think it's wonderful, if it gets people wishing for good things thats great, how nice as well to see the local council becoming involved , I dont think it's going to hurt the tree, we have one of those at the bottom of our garden ,they are as tough as old boots.